Taste deliciously different exotic tropical fruit wines at de Brueys Boutique Wines and Functions Venue, a unique Winery and Cellar Door set amidst mango orchards and natural open forest. 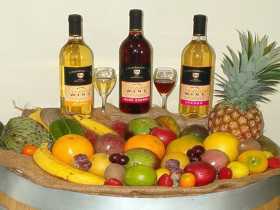 Tropical wines include marvellous mango, luscious lychee, jaboticaba, passionfruit and native bush cherry. Award winning ports and liqueurs are all made on site by winemaker, Bob de Brueys. Sample Mango, Mulberry and Swagman Ports. Be tempted by cream liqueurs - Tropical Temptation (reminiscent of an Irish Cream), Strawberry Temptation, Coffee Temptation and Envy (a delicious new honeydew cream). Cream liqueurs are lactose free. Flagship Coffee Elixir and Pirates Treasure (rum and chocolate) and new Druid's Nectar are very popular liqueurs. 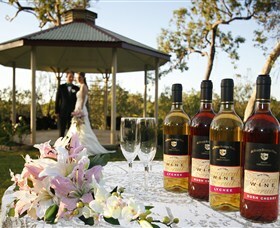 Owners and winemakers, Bob and Elaine de Brueys, are genial hosts, and their functions facility is now open for weddings (has own gazebo/wedding chapel), corporate functions, parties, workshops and conferences. The venue is adjacent to the Winery, and the nearby outdoor deck overlooks the large lake on site, surrounded by open forest and orchards - just superb. Elaine and Bob will make you very welcome, please drop by for a delicious surprise. Online orders are taken along with email, phone and mail orders.